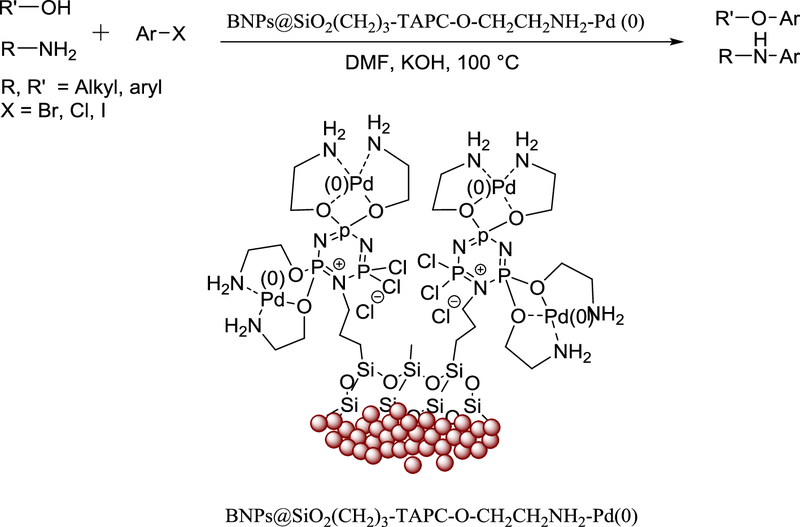 The thermally stable new heterogenous nanocatalyst BNPs@SiO2(CH2)3-TAPC-O-CH2CH2NH2-Pd(0) was synthesized, characterized and successfully applied in carbon-heteroatom (C–O and C–N) coupling reactions of aryl halides with phenols and amines. The formation of resultant nanocatalyst was approved by FT-IR, XRD, TGA, XPS and EDX techniques. The morphology of BNPs@SiO2(CH2)3-TAPC-O-CH2CH2NH2-Pd(0) was characterized using scanning and transmission electron microscopes. The leaching of palladium from the surface of the catalyst was studid by ICP-OES technique. Noteworthy, the highly active BNPs@SiO2(CH2)3-TAPC-O-CH2CH2NH2-Pd(0) can be easily recycled and reused for six times with negligible loss in its activity. Some remarkable advantages of this method are the shorter reaction times, milder conditions, no needs for an inert atmosphere, high yields and easy separation. 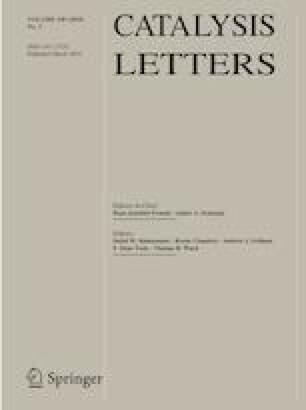 The online version of this article ( https://doi.org/10.1007/s10562-018-2627-6) contains supplementary material, which is available to authorized users. The authors gratefully appreciated the financial support of this work by the research council of Razi University.